Look and feel your very best. We'll make your dream wedding a reality. Bellisima Salon provides the ultimate in beauty treatments in a relaxed and unique environment. Our salon creates a unique experience for individuals by customizing services that fit their needs. Transform your look with a bold new haircut and color that complements your unique style. Enjoy a day of pampering with a relaxing manicure and pedicure to reveal shiny, healthy nails. Enjoy one of our signature specialized facial treatments or an aromatherapy body wrap. 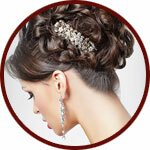 Your bridal party will be beautiful from head to toe with hair, makeup and nails for the big day.